Lend a Hand to SVdP! We are hoping you can Lend a Hand and help us with a major project at our Central Warehouse Donation Processing Center in Georgetown. We have five St. Vincent de Paul thrift stores that are receiving hundreds of donations per day. In a major effort to reduce costs and increase revenues at our thrift stores, we are centralizing the sorting, pricing, and tagging of thousands of items placed on our sales floors. The bottom line is this: The quicker we get product on the floor, the faster we can sell items to fund our programs. We really need a steady stream of volunteers to help us with this project. Literally, we need groups of 5, 10, 15 and 20 volunteers in groups interested in giving back to the community to help us with this huge project. Our warehouse can easily accommodate 15-20 volunteers at one time to help with this project. Volunteers play a significant role in helping us reduce costs and maximize revenues. 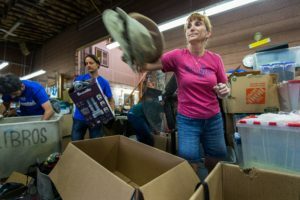 Additionally, volunteer assignments serve as great team building initiatives for corporations, schools, associations, and all groups interested in giving back to their community! Lending a hand in service to our neighbors is the “core” of who we are and what we do. We have been helping neighbors in the greater Seattle area since 1920. Organize a Volunteer Team of five or more people, pick a date, and contact us at volunteer@svdpseattle.org to set up a date!